Jumbo loans are back in a big way, and we mean BIG savings. Typically, jumbo loans have higher interest rates than traditional, conforming mortgage loans … but not now! A jumbo loan means you can borrow more money than with a traditional loan — that is fantastic news for high-cost areas such as the DC metro region! The minimum loan amount for a jumbo loan is $625,500 in the DC area, and the maximum loan amount depends on the guidelines of the lender you choose. Typically mortgage lenders are able to loan up to $2,500,000 without a special exception. 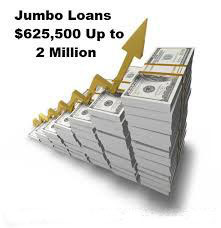 Jumbo loan amounts are available with guaranteed fixed rates for the life of the loan, and adjustable rates, where you agree to share longer term interest rate risk with your lender in exchange for a lower starting rate for 5 or 7 years. Jumbo loans are called “nonconforming” mortgage loans, since they exceed the “conforming” loan limits outlined by Fannie Mae and Freddie Mac. These loans are not sold to Fannie Mae or Freddie Mac, and are typically held by your bank or a large institutional investor. Sounds confusing, but it’s really not. If your loan amount is over $625,500, you have a jumbo loan. Why are they so affordable right now? This flip in mortgage affordability won’t last long, so take advantage of it if you are in this loan amount bracket. Why is this happening now? Lenders want to do business with well-heeled clients who can make the larger monthly payments that come with a larger loan amount. Since more investors want these loans, it has created market competition, which is always a win for consumers. Lenders have had to sharpen their pencils and offer the best deals to attract this client base. At least six months’ worth (or 20% of the loan) of reserves in bank account after closing. Conforming loan borrowers, on the other hand, may need just one or two months’ worth of mortgage payments set aside. We like to stay on the cutting edge of what is happening right now so we had a recent visit from Mark Baker from Capitol One Bank to our Dwell Headquarters. He explained to us all the details about jumbo loans — he can do the same for you too! You can reach him at Mark.Baker@capitalone.com.